Different day, same story for Good Magic, the Kentucky Derby runner-up, Thursday morning at Pimlico in Baltimore, Md.. For the third consecutive morning since his arrival from New York on Monday, Good Magic trained over a track that was labeled either muddy or sloppy. Back at the barn, Brown's traveling assistant, Baldo Hernandez, wryly noted that the rain abated, almost as soon as Good Magic completed his training. Brown is expected to arrive in Baltimore on Friday, perhaps in time for Good Magic's training. Good Magic's jockey, Jose Ortiz, is expected to arrive late Thursday evening, as he is named to ride in several stakes at Pimlico on Friday, including Indy Union in the Xpressbet Black-Eyed Susan Stakes (G2). The 2017 Eclipse Award-winning rider won his first Classic race last year aboard Tapwrit in the Belmont Stakes (G1). Ortiz finished 10th and last aboard longshot Term of Art in last year's Preakness, which marked his first time riding in the Middle Jewel of the Triple Crown. Ortiz, 24, said he is optimistic that he and Good Magic can get the better of Justify, the 1-2 morning-line favorite, in the Preakness, even though it's a real possibility that Justify will get the same wet conditions that propelled him to a 2 1/2-length victory in the Kentucky Derby. “It's a small field and if we have a clean trip, I'm sure we could turn the tables on [Justify] on Saturday,” Ortiz said by phone from New York on Thursday morning. “We just have to make up 2 1/2 lengths. It's not like he beat us 10 or 20 lengths. As far as race tactics go, Ortiz has a specific plan in mind for e Five Racing Thoroughbreds and Stonestreet Stables' Good Magic, the second choice at odds of 3-1 who will break from Post No. 5. 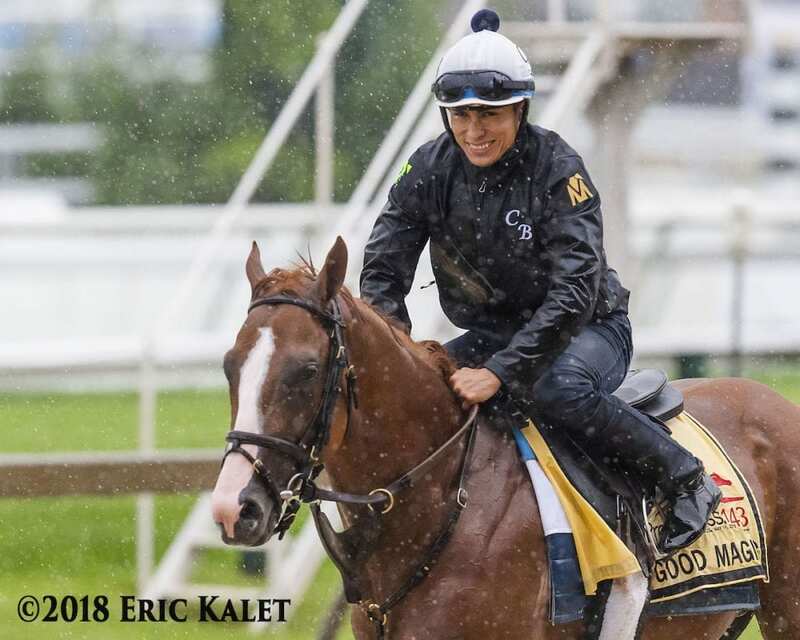 This entry was posted in NL Article, Triple Crown and tagged 2018 preakness, Baldo Hernandez, Chad Brown, good magic, jose ortiz, Justify, pimlico, preakness, Walter Malasquez by Press Release. Bookmark the permalink.